Lena Gillis was born on August 7, 1996. She trained at Fairland Gymnastics through the 2007 season. She then moved to Sportsplex at Prince George's Sport and Learning Complex. She will graduate from high school in 2014. In 2006, Lena competed level four. She had one of the top six all-around scores at the Maryland State Championships. 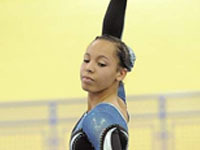 She moved up to level five in 2007, finishing third on vault and fourth all-around at the Maryland State Championships. She competed level six in 2008, placing second on vault and fourth on floor at the State Championships. She moved up to level seven in 2009. She represented Team Maryland at the National Judges Cup. She won bars and beam at the State Championships. She placed second all-around. Lena competed level eight in 2010. She finished first on vault, bars, beam and the all-around at the Sportsplex Team Classic. She finished second all-around and first on vault at the Emerald City Classic. She won vault, bars and the all-around at the State Championships. Lena moved up to level nine for the 2010-2011 season. She won vault and bars at the 2010 Dave Brown meet. She did not compete the rest of the season. In 2012, Lena finished first on vault and the all-around at the Sportsplex Team Classic. She won vault at the Manhattan Classic. She finished third all-around at the Excalibur Cup and Capital Cup. She finished third on floor and ninth all-around at Regionals. In 2013, Lena finished first on vault at the Atlanta Crown Invitational. She won vault, beam and the all-around at the Sportsplex Team Classic. Lena won vault, beam, floor and the all-around at the Manhattan Classic. She placed first on bars at the Gasparilla Classic. She won vault, bars and the all-around at the State Championships. Lena placed first on bars, beam, floor and the all-around at Regionals. At Easterns, she won beam! She also placed fourth on floor and second all-around.